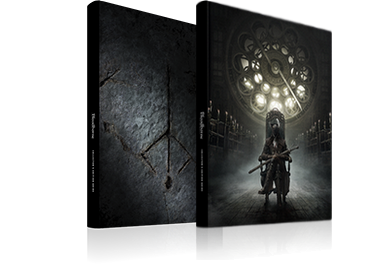 UPDATE 28/3/15 10:40am: Our Bloodborne analysis is now complete, culminating in a new piece published today comparing the technology of the PS4 exclusive with the upcoming Dark Souls 2 remaster. Our tests reveal that playing Bloodborne in multiplayer mode can impact frame-rates significantly, resulting - at worst - in sub-20fps gameplay. Here's the video, but check out our full analysis for more insight. UPDATE 26/3/15 2:35pm: Sony says that a new patch is in development to address Bloodborne performance and loading time issues, but in the meantime, we've compiled more loading data across a series of different hard drive technologies. If you're thinking of upgrading your drive anyway, and you're a committed Bloodborne player, our findings may help you to choose the kind of drive that offers the best mixture of value and performance. Original Story: It's here at last. For anyone yet to pick up a PlayStation 4, and in particular fans of the Souls series, Bloodborne's release today could mark a justifiable tipping point. Having edged our way through the opening Yharnam city area, early impressions suggest another genuine triumph by From Software - and we can now provide a spoiler-free analysis of what's in store. The team's beautiful, horror-inflected world is no doubt a high point, but as with its previous games, there are also obvious technical issues that go alongside its ambition. And where better to start than the beginning? Below is a lengthy, ten minute frame-rate analysis, taken from the first moment we're set loose with a saw-cleaver. Barring a few tactical cuts (to spare you the lengthy loading screens between deaths), the video runs more or less in sequence right up to the first major boss. Understandably, this is a series that sells on its mystery - but a deep slice of this single area tells us much about where Bloodborne stands tall, and where it falls short. Running with update 1.01 (weighing in at 2.69GB), the day one patch is essential. Game performance and stability is improved according to its patch notes, and it also adds the game's crucial multiplayer features. However, in line with embargo conditions set to press, we're advised by Sony to avoid online play up to release, meaning our frame-rate tests run without any potential strain of co-op play. So what's the story? Well the bad news is quite simply that, despite implementing a 30fps cap, Bloodborne struggles to run at a smooth frame-rate. Across the breadth of our tests in both Central Yharnam and the Hunter's Dream hub area, genuine drops are infrequent, but a factor that drags performance down to brief lows of 24fps. Rolling through Havok-based destructible objects (which populate the world in incredible number this time), attacking too many townsfolk at once, and also the use of alpha transparencies are to blame. Essentially, it's the usual culprits for this series. Video: Bloodborne PS4 Gameplay Frame-Rate Test by DigitalFoundry But this alone isn't a major issue. Such drops show a 60fps target was always a stretch for a game running with this level of detail - the world filled as it is with a staggering density of objects. Every new area is cluttered with points of interest, from coffins twisted in chains, looming gargoyles, derelict wagons and crooked iron fences. It's a richly bleak sprawl set on cobblestones, tightly wound, and yet its vistas broad enough to show your small place in the city. This high level of geometry is unlike anything we've seen from the studio before. As ever, level-of-detail (LOD) transitions are often too discrete to catch by eye, with the worst occurring for just a split-second on loading a new area. There are twists and turns that catch the engine off-guard too, but for the most part it streams in assets without a sweat. And yet something is awry when playing Bloodborne. Its sub-30fps frame-rate drops may be infrequent, but on close analysis the bigger issue here is in its frame-pacing. As it turns out, From Software's implementation of a 30fps cap means that, as promised, we do get an average refresh at that number near-constantly throughout Yharnam city. The problem? As we've seen with the launch builds of Need for Speed: Rivals and Destiny, an incorrect ordering of frames can cause a nasty stuttering to motion. Though its 30fps average is technically correct, Bloodborne often produces two unique frames followed by two duplicates - rather than one after another - creating a perception of frame-rate drops throughout. It's not smooth in motion at all as a result, and frame-time updates swing erratically between 16ms and 66ms - and sometimes higher. It's an unfortunate oversight by From Software. However, we have seen both Bungie and EA Gothenburg react to the issue in each case, correcting their games soon after launch. We hope this will be the case for Bloodborne as well. Bloodborne's other pending issue is its loading times. Longer than any Souls title before it, reviving at a lamp in Central Yharnam takes between 40-45 seconds - a patience-testing number given the frequency of death in this game. It's also a nuisance due to the game's hub-world structure, where each level loads from the Hunter's Dream area, which in itself takes 12 seconds to load. The obvious question is to what extent upgrading to an SSD might solve the issue. We gave this a test, swapping out the stock PS4 drive for a Sandisk Extreme Pro 480GB SSD, and find that loading times are reduced by around 25 per cent overall. The SSD upgrade has a cumulative effect. After dying over and over, plus warping back and forth, a 25 per cent saving on the time spent looking at the loading screen could seriously add up by the time the game is complete. It also makes each of the (many) losses a bit easier to take; the last thing we want is a lengthy wait for another shot at a tricky section, and this upgrade at least softens the blow. It doesn't pull it back in line with Dark Souls titles' turnaround, which tended to reload within 10-20 seconds on PS3. However, until From Software swoops in with a patch to optimise this aspect, upgrading your PS4's to an SSD is easily the best option for a fresh Bloodborne playthrough. UPDATE 26/3/15 2:35pm: It's fair to say Bloodborne's loading times are too long, but you needn't fork out for an expensive SSD to chop them down to a more manageable length. Our updated table above shows that a hybrid SSHD brings a cost-effective gain in loading speeds for each area without the crippling price penalty of a full SSD. Above, we've expanded our test range across more areas, where we see Old Yharnam particularly suffering. This lasts as long as 54 seconds for each respawn on the PS4's stock HDD, making any death in this area particularly punitive. By comparison, a 1TB SSHD brings that number down to 39 seconds, while an SSD shaves it a little further to 36.8 seconds. The PS4's stock drive is a 5,400rpm model with slow seek times that delivers the worst results. Next best is the 7,200rpm HDD, which is sharply improved by the SSHD and SSD drives. Sony states that Bloodborne's loading times are already a focus of an upcoming patch. We'll see just how radical the improvements are, but for now it appears installing the game to an SSHD is a great starting point. For those already considering an upgrade for their PS4 hard drive, it's an option that could kill two birds with one stone. Check out our hard drive upgrade guide for data on more titles - not all games see anything like the improvement found in Bloodborne, which is worth factoring into any purchasing decision. Putting the frustrating loading times aside, even based on its early stages Bloodborne stands up among From Software's most memorable creations. It's a horror-tinged fantasy that's sure to magnetise Souls fans towards Sony's new machine, despite some technical shortfalls that can frustrate. It may be that these are part and parcel with upholding the amazing scale of its world, but it's very possible a future patch will smooth some rougher points, in particular the unusual frame-pacing. On that note we'll have to wait and see. Nevertheless the core of the adventure is engaging, with a game design built from the ground up for PlayStation 4 hardware. The bigger story going forward is how its technical direction differs from the upcoming Dark Souls 2 remaster on PS4. On current evidence, both have their obvious advantages, though later areas in Bloodborne will show just how crucial that 30fps cap is in allowing for a more visually complex world design. Despite its frame-pacing issues and long load times, Bloodborne is still very much worth the rush of commotion it's receiving this week. The game sits high in the hierarchy of quality PS4 exclusives, its only real competition in the gameplay stakes coming via From Software's very own remaster of Dark Souls 2, due out next week. With a new enemy layout, improved lighting and 1080p60 gameplay, the remaster's bid for relevancy is strong, but does Scholar of the First Sin keep up on technical grounds, or does Sony's exclusive steal the show? Similar to Dark Souls 2, Bloodborne lives up to its resolution promise. A close pixel count shows a true, native 1920x1080 title at work, and save for the pixel crawl on the game's fences and fur shaders, the results are often impressive. However, a heavy chromatic aberration effect is applied to Bloodborne: mimicking the qualities of a low quality lens, the effect applies a distortion to anything from the embers of a bonfire to the chrome flash on a wagon-wheel, and splits light into its constituent colours. It's fair to say this post-process trick won't be to everyone's tastes. Reportedly using Silicon Studio's Yebis 3 optical effects suite (also seen in Final Fantasy 15) the sheer strength of this filter can distract. At range, it heavily blurs the edges of the screen, and also exaggerates any pixel-crawl evident across tight-knit cobblestones and fences. This side-effect is the game's only real visual shortcoming, as the rest of the game - between the dynamic lighting and the sharp texture-work of Yharnam's streets - looks exceptional. Yharnam's intricate detailing more than makes up for this. Unlike Dark Souls 2's early Heide's Tower of Flame section, which layers its stone pathways with high resolution but ultimately flat-looking normal maps, Bloodborne is far more ambitious. Each segment of its world benefits from what appears to be tessellation (or costly parallax occlusion mapping), which in conjunction with a displacement map gives the city's rickety brick roads unique juts and divots. For the Hunter's Dream hub, each stone slab surrounding its enclave pops outward in a 3D fashion, giving everything a very organic look. The results are fantastic, and with strong anisotropic filtering in tow, it places Bloodborne's world among the most detailed seen from the studio. Dark Souls 2 doesn't go entirely without though; its textures are pinpoint-sharp in the PS4 remaster thanks to the use of PC-grade assets, while a new high-dynamic range filter increases their contrast. Instances of tessellation are also spotted in specific spots around Heide's Tower, though Bloodborne uses this trick to an extreme that Dark Souls 2 doesn't match. Bloodborne's enemy models take a leap in quality too. Even the most basic townsfolk feature fur shaders, an evident boost in polygon count, plus cloth physics. Dark Souls 2's minion designs are basic by contrast, tending towards armour-clad knights that keep its RAM footprint low, better suiting its cross-gen status. In an interview with From Software staff, programmer Jun Ito says, "up until now we've worked in worlds that feature a lot of armour." However, he goes on to describes how PS4 unlocked new options for Bloodborne, where the team "spent a lot of CPU power, [especially] on simulating fabric." Indeed, Havok physics play a big part in making From Software's worlds and characters more tangible. A player's cloak-tails now dynamically whip around to each step, and even its front buckles individually sway to motion. Yharnam's every corner is replete with destructible urns and crates too, giving an otherwise rigid town layout a dense, lived-in appearance. Best of all, full ragdoll physics are in place for all enemies in Bloodborne. This means slain ogres can tangle round a player's ankles while running past, often creating humorous moments where a bodies roll haphazardly behind. It's a playful aside to the experience that director Hidetaka Miyazaki clearly intends for his games, and hence its physics are similar to those in Demon's Souls and the first Dark Souls. Its removal in Dark Souls 2 - a game produced with Miyazaki in only a supervisor position - instead has larger enemies fizzling out of view on death, or simply laying static on the ground. Returning to Bloodborne's single-player mode, exploration of areas deeper into the game reveals the same performance profile as our initial analysis - frame-pacing issues aside, the game doesn't have anything like the same problems maintaining 30fps as it does in multiplayer mode. Both PS4 games feature ambient occlusion too, and in each case the result is more nuanced than the dithered approach used on last-gen Dark Souls 2. This shades in areas beneath grass tufts, and in Bloodborne's case, behind the overhanging plants the Hunter's Dream - though its chromatic aberration makes this harder to catch by eye. The PS4 exclusive also boasts much improved specular mapping, giving floors a dripping wet, dewy effect, as also shown on a player's blood-soaked cloak after battle. The low dusk sun in Central Yharnam draws out other interesting details. Curiously, we see player shadows falling at an odd angle relative to the sun's position (notably near its main lamp). It's thankfully not an issue later on, but it makes clear that dynamic shadows aren't Bloodborne's strong suit, with bonfires leaving no shadow at all. It's unlike Dark Souls 2, where shadows are produced by any torch or flame. A point in favour of the older game is unexpected, especially as this feature hangs over from an earlier build (as seen at E3) where interplay with lighting was a greater focus. On balance, Bloodborne is a far more accomplished game on the visual front. Its geometry, effects, and even its lighting model are put to better use to project a grim landscape of hunters, beasts, coffins and gravestones. However, it pays the price dearly in performance, especially when inviting a friend for co-op play. Right off the bat, we're looking at a performance read-out at between 20-30fps when tackling early areas in multiplayer. This is despite the game unfolding at a mostly locked 30fps in our offline tests (albeit with frame-pacing issues). However, inviting up to two fellow hunters to tackle the same section produces lengthy, stuttering stretches of play at 20fps, with our lowest reading hitting 16fps. It's not pleasant, and clearly its netcode tips the scales too far for From Software's PS4 engine. And again, solo play in the exact same areas is entirely unaffected. Compared to Dark Souls 2's remaster on PS4, which runs at mostly 60fps with some dips, this shows a classic trade-off between performance and graphics quality. The remaster is simpler in visual design certainly, but we get a sharpness in controller response at 60fps that's simply not afforded by From Software's sub-30fps title. For landing crucial parries, this uneven frame-rate can make all the difference between success and another "you died" screen. Due to Bloodborne's more offensive combat style, such drops inevitably punish players to a greater extent. As opposed to raising the shield in Dark Souls 2, the emphasis is on precise dodges and committed counter-strikes, meaning a sudden nose-dive in frame-rate impacts the crucial interface between player and game. The cause isn't always obvious either; one moment it's apparent that a huddle of hunters prompts a 20fps spell, but in the next, the exact same scene runs at a solid 30fps. All told, it's an area that's in serious need of addressing via a future patch. Fans of Dark Souls on PS3 and Xbox 360 will be familiar with this level of performance already, and much worse. However this is where Dark Souls 2's delivery at 60fps stands out in comparison to Bloodborne. The doubling of the original frame-rate stands playability in much better stead, should it ever drop to the mid-40s on heavy alpha. Even so, it's worth stressing we've yet to test the impact of its multiplayer features on PS4, and whether Bloodborne's drops are a sign of things to come. The fact that we have not one, but two great Souls games on PS4 is an unusual luxury. From Software walks two separate paths, and returns with two different visions of what a Souls game could be. Without a doubt, Bloodborne is the technical showcase of the two, and a true current-gen successor to the Dark Souls throne - packed as it is with a level of detail far beyond last-gen's reach. Having tested its multiplayer features, it clearly needs further optimisation to better sustain its 30fps lock, but if you intend to go solo, the game produces some of the most striking visuals on PS4 to date. Dark Souls 2: Scholar of the First Sin is also set to impress based on what we've played so far, but its world design clearly hangs on last-gen limits. As a result it lacks the Bloodborne's visual complexity, though this does oil the gates for easier 60fps playback in the remaster. Its dynamic shadow system also has advantages over the PS4 exclusive, a curious remnant of the game's first E3 Showing. In fact, it's a shame this feature of Dark Souls 2 didn't come to full fruition, as we suspect a more fascinating tussle with Bloodborne's final direction could have been on the cards. From Software's new in-house tech will factor into whatever it produces next, but the idea of catapulting the Dark Souls series down its own technological path is also very compelling. As a design choice, the PS4 remaster's 60fps is a huge benefit to control precision during combat and we wonder whether the developer may choose to retain this edge for its next Souls title. It's a fixture swapped out for a much more ambitious visual design in Bloodborne - clearly in need of a further round of optimisation just to maintain its 30fps target. Regardless, as Dark Souls looks to forge its own way, consistent, strong performance is a principle we hope to see upheld for any upcoming third entry.